EDL's self adhesive thermocouples utilize a high strength Teflon or Kapton tape material with a high temperature silicone based adhesive. Within this tape is embedded a # 36 gauge fine wire thermocouple. The fine gauge thermocouple provides excellent sensitivity and extremely fast response times. These sensors are available in all thermocouple types (E, J, K, or T). The standard lead length is 32" long (Teflon ZIP wire) however additional lead lengths are available. Extension cable may also be used to facilitate connecting transmitters and control panels as well as local monitoring. 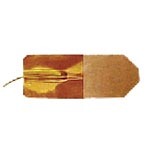 The self-adhesive thermocouple may be trimmed to suit your particular application. These thermocouples are packaged in a quantity of 5 to a box and are optionally available with NIST traceable calibration certification. Copyright Electronic Development Labs, Inc.. All Rights Reserved. eCommerce Software by 3dcart.